As people come inside my front door, two features are prominent: Japanese art and irises. A komono hangs above the landing, Japanese and American irises hang on the walls. I surround myself with beauty wherever I can. Did I always love Japan? When I was in elementary school, I remember watching Buddhist monks in meditation in some kind of documentary. Then I practiced what I saw in my dark basement, hoping for what—I don’t know. Kozaishō came to me first as a voice. I heard, “as if being the fifth daughter…” repeatedly for several days. Finally, I took a yellow pad and wrote whatever she said, until she stopped talking. I did that every day for two weeks. 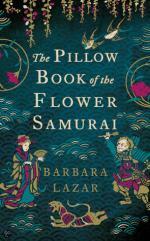 That was the rough — rough — plot of The Pillow Book of the Flower Samurai. I did not even know what century the armor I saw in my mind’s movie was in. Fortunately, I lived near Beverly Hills, California, and their library was fabulous. I checked in a costume-by-century book and Michimori recognized’s armor, twelfth century. Voilà! After a few decades of research, years of writing groups, dozens of how to write conferences, workshops and about 20,000 revisions, here is The Pillow Book of the Flower Samurai. In between then and now, I have been busy. I taught in California and, after moving to San Antonio, Texas, taught there. I still do. Now I have a poetry class for senior citizens. Students can range from 50 to 120. They hobble, carry oxygen whenever and come to my class. It is such an honor, and I learned so much from them. My philosophy is the best student is one who teaches, and the best teacher is one who learns. I keep learning and love it.